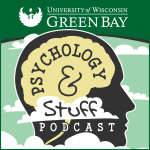 The Psychology Program at the University of Wisconsin-Green Bay just launched a new podcast, Psychology and Stuff, where we discuss interesting topics related to psychology. Want to learn more about Autism? Or maybe better understand the psychological value of helping people? Check out Psychology and Stuff, available on iTunes or on the UWGB psychology program blog. This entry was posted in News, Resources by Ryan Martin. Bookmark the permalink.